Dr. Indrakrishnan and Dr. Manoj Shah enjoy Congressman Tom Price’s speech. 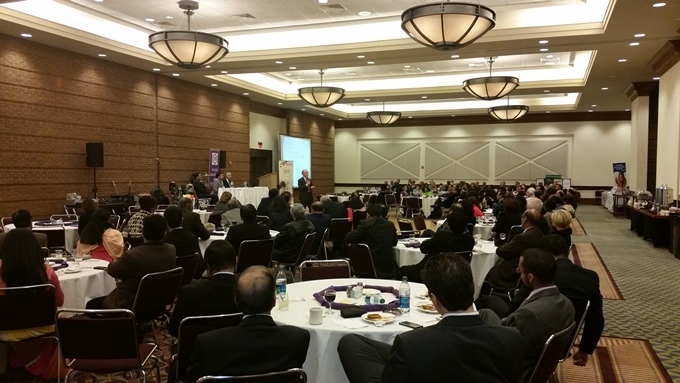 Georgia Association of Physicians of Indian Heritage (GAPI) held its Columbus regional meeting on February 7, 2015 at the Columbus Georgia Convention and Trade Center. Dr. Piyush Patel, past president of GAPI, spearheaded the event which was co-hosted by Medical Association of Georgia (MAG), Columbus Fort-Benning Association, Muscogee County Medical Society, and the Georgia chapter of Association of Physicians of Pakistani Descent of North America (APPNA). More than 150 attendees from Columbus and neighboring cities participated in this meeting, which provided ample education and entertainment combined with a taste of India. Tennent Slack, M.D, a pain management specialist and co-chair of the MAG Foundation’s ‘Think About It’ campaign, presented “The Prescription Opioid Overdose Epidemic.” He gave details of narcotic use in the USA, and a database started in Georgia for tracking patients who use narcotics and schedule II meds. Chief Guest Congressman Tom Price, M.D, chair of the House Budget Committee in Washington D. C., spoke about difficult issues faced by physicians and patients under the current healthcare system. He explained what he and his colleagues are working on to provide better healthcare and discussed the future of healthcare insurance coverage. Representative Price spent time meeting with the physicians individually and in groups, discussing their needs in taking care of their patients. Dr. Indrakrishnan commended him on his astuteness in healthcare issues and for acting as a voice for physicians and patients in Washington D.C.; he presented a book titled Hindu Temples in North America: a Celebration of Life, by Mahalingum Kolapen, to Rep. Tom Price on behalf of GAPI. Dr. Piyush Patel, Dr. Manoj Shah, Dr. Indrakrishnan presenting the book to Senator Tom Price. Guest of honor was Dr. Manoj Shah, president of MAG and past president of GAPI. He is the first individual of Indian origin to become MAG President. He spoke about MAG’s work with the American Medical Association. He discussed marijuana for research in epilepsy, prescription authority for hydrocodone by midlevel providers, and pharmacists prescribing vaccines. He noted that Medicaid has been paying Medicare rate for the last two years as a result of the Affordable Care Act, and MAG is working to make sure that the State of Georgia continues to do so. Dr. Indrakrishnan honored Dr. Shah with a plaque on behalf of GAPI. Dr Naresh Parikh, secretary American Association of Physicians of Indian Origin (AAPI) and a past GAPI president, spoke on AAPI's Global Health Summit held in Mumbai early this year on traumatic brain injuries and the needed guidelines. Young Sharvil Patel of Columbus High School, a potential future GAPI member, emceed the event. A scrumptious dinner with both American and Indian dishes was served at the end of the meeting. Scintillating live music was provided by the Misty Harbor Band of Columbus. at the Columbus Georgia Convention and Trade Center. Before the general meeting, a GAPI board meeting was presided over by GAPI President Dr. Indran Indrakrishnan. Participants were the executive committee, past presidents, and Board of Directors: Drs. Manoj Shah, Naresh Parikh, Asha Parikh, Sudha Tata, Piyush Patel, Raghu Lolabattu, P.H. Patel, Vijay Maurya, and Mahesh Patel. The upcoming annual convention and the election for the new officers were discussed. Dr. Indrakrishnan thanked Dr. Piuysh Patel for organizing the meeting. He further apprised the audience of GAPI’s educational, philanthropic, humanitarian, political, entertaining, and social activities in the last year in Atlanta and other regions of Georgia. He reminded members about the upcoming Warner Robins regional meeting on March 7th and GAPI annual convention on May 2nd 2015.